Title: 'Poloniae Regnum ut et Magni Ducatus Lithuaniae'. 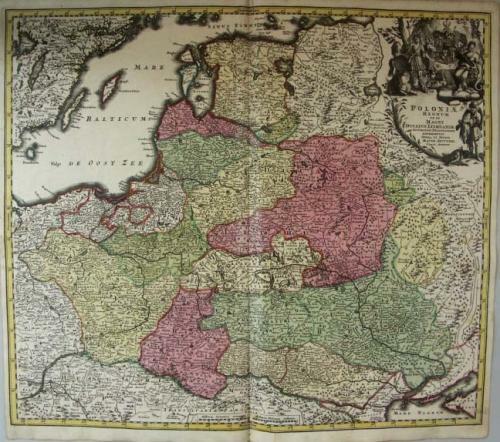 A large decorative map of Poland, Lithuania and the Ukraine, white Russia and parts of Schlesiens between Stettin, Vienna, the black sea and St. Petersburg. Right above is a decorative large cartouche with a costume figure, animals, allegorical representations and a coat of arms. The map is in good condition on strong paper with mild toning and a small centerfold split.